When Peter Congdon won £13.5 in the National Lottery he promised to help the multiple sclerosis facility which supported his late wife Rosemary. Just recently, Congdon made good on his promise by donating a Land Rover Discovery worth £33,000. 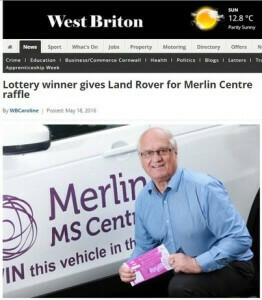 The vehicle will be used as a raffle prize to raise money for the Merlin MS Centre. Mrs. Congdon died in 2008, but his husband remembers the excellent care she received for MS and he has proven he is in a position to repay their kindness in a big way.